Kepler was born to a poor family in Weil der Stadt, Germany, on December 27, 1571. He was a sickly child and nearly died of smallpox when he was four years old. He worked intensely throughout his life as if to justify his own survival. His interest in astronomy may date from age six, when he was greatly impressed by the appearance of a comet. In 1587 he obtained a scholarship to attend the University of Tübingen. There he studied astronomy under Michael Mästlin, an adherent of COPERNICUS’s view that the planets orbit the Sun. 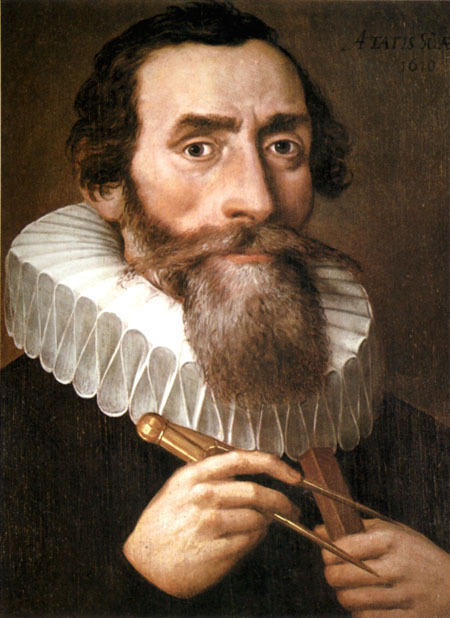 Kepler immediately accepted the Copernican theory. In 1600 Kepler joined Danish astronomer TYCHO BRAHE at his observatory near Prague. Upon Brahe’s death in 1601, Kepler replaced him as court astronomer to the Holy Roman Emperor. Kepler attempted to calculate the orbit of Mars, and this eventually led him to develop two theories, which he introduced in New Astronomy in 1609. The first theory stated that the planets follow elliptical orbits, with the Sun at one focus. The second stated that an imaginary line from the center of the Sun to the center of a planet always sweeps over an equal area of its ellipse in equal time, meaning that planets travel faster when they are closer to the Sun. After moving to Linz, Austria, in 1611, Kepler wrote the treatise that contains his third theory of planetary motion. In Harmonics of the World, published in 1619, he showed that the square of the time a planet takes to orbit the Sun (its period) is proportional to the cube of the planet’s mean distance from the Sun. All of Kepler’s astronomical discoveries were brought together in Epitome of Copernican Astronomy, which appeared between 1618 and 1621. The work became the first textbook of astronomy grounded on Copernican principles. In 1627 Kepler finished the Rudolfine Tables, improved tables of planetary motion based on Brahe’s painstaking observations and research. He died in Regensburg on November 15, 1630. Kepler’s three theories of planetary motion, now known as Kepler’s laws, are essential elements of the modern understanding of astronomy. Kepler’s revolutionary ideas emerged just as the views of Copernicus became the focus of a violent intellectual controversy. The Ptolemaic system, in which Earth was viewed as the center of the universe, had been in vogue for nearly 1,400 years. Copernicus voiced his heliocentric theory in 1543, and the Roman Catholic church was so offended at the suggestion that it banned Copernicus’s major work in 1616. Tycho Brahe attempted to verify Copernicus’s claim by vastly improving measurements of stellar and planetary positions, and his data influenced Kepler’s ideas. Kepler’s Epitome of Copernican Astronomy became the most influential book in astronomy for three decades. It converted many astronomers from Ptolemaic to Copernican views. GALILEO, already strongly supportive of the Copernican system, was encouraged by Kepler’s calculations. Galileo published his views in 1632 and was subsequently persecuted by the Roman Catholic Church during the Inquisition. ISAAC NEWTON also relied on Kepler’s work, particularly his third law, to formulate the theory of gravitational force. In 1687, Newton published his Principia, in which he described the gravitational force that governs objects on Earth’s surface as well as the orbits of the moon and the planets. He used the gravitational force to measure the mass of the Sun and to calculate the orbit of a comet. Gravitational theory was both derived from and helped to confirm Kepler’s three laws. Kepler’s Rudolfine Tables were the first modern tables of planetary motion and enabled future astronomers to calculate the positions of the planets at any past, present, or future time.